Those who are not in the loop, may think of all cryptocurrencies as being one and the same, with perhaps some slight differences in their price. But this is far from the fact. 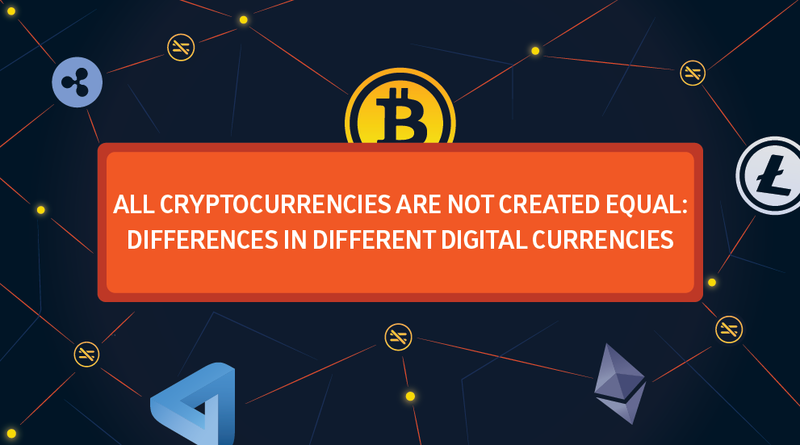 Most cryptocurrencies have fundamental differences in function and code, as well as in price and market cap, and a number of other key differences. When a digital token comes out, it does eventually have some sort of value assigned to it based on certain factors. Sadly, however, there are many digital tokens and their ICO’s coming out that seem to have no practical purpose, or are full of promises for the future. These as well, unfortunately perhaps, will likely still rise in value simply because people invest in them. One author from TechCrunch shares his despair on the matter. There are many digital currencies on the other hand that do have practical use in one form or another. With at least 1,048 cryptocurrencies and counting, with a total market cap of around $125,154,464,846 USD, there’s going to be some good ones. Let’s take a look at some of these, and see the massive differences at hand. All Prices were taken from August 11th, 2017, Singapore / Bali / Perth time from coinmarketcap.com. Bitcoin: Bitcoin is the first peer-to-peer digital cash system protected from double spending by the concept of the blockchain – a distributed public ledger. It came about from 2008-2009 through the pseudonymous name of Satoshi Nakamoto. Bitcoin by far is the most popular cryptocurrency. It holds no special function except to be accepted as a form of decentralized value by it’s pundits. It has gained wide acceptance both online and in brick and mortar stores. Often referred to as ‘digital gold’ BTC has the highest value of any digital token, which has boomed during 2017 (and many believe many other cryptocurrencies have as well in it’s wake). According to coinmarketcap.com, BTC recently had a price of $3,428.44 USD to 1 BTC, and a market cap of $56,571,101,072 USD (16,500,537 BTC), and a circulating supply of 16,500,537 BTC out of a Max of 21,000,000 BTC. Furthermore, within a 24 hour time period, it’s had a movement volume of $1,669,970,000 USD (481,116 BTC)! Bitcoins can be divided down to 8 decimal places. The concept of the blockchain, stemming from Bitcoin, is what’s given rise to so many different digital currencies and interesting blockchain projects. Ethereum: Ethereum was proposed by Vitalik Buterin late in 2013, funded in mid 2014, and went live on July 30th, 2015. Ethereum was designed to take Bitcoin’s blockchain concept a step further, allowing companies to use it’s Ethereum blockchain to make decentralized applications. Ether wasn’t designed to be a flat-out currency (though it has grown to a high value), rather, it was designed to be “fuel” for the Ethereum network’s operation. It’s value was recently around $302.22 USD per 1 ETH, 2nd in value only to Bitcoin (after it passed by former-2nd place, Litecoin) – but this may not be the case for very long, with other altcoins making their way up the ladder. Ethereum also had a market cap of $28,383,679,209 USD (8,197,857 BTC), with a circulating supply of 93,918,208 ETH. Within a 24 hour period, it’s had a movement volume of $1,059,560,000 USD (306,024 BTC) worth. It is worth noting that both Bitcoin and Ethereum (as well as others) have undergone blockchain forks (or splits in the blockchain), which have resulted in various altcoins, including Ethereum Classic, and the most recent: Bitcoin Cash). Ripple: RippleNet is a blockchain platform designed to help payment providers, banks, and digital asset exchanges create quick and easy ways to send money globally, it was designed to help with global payments. Ripple (XRP) was established in 2012. Ripple’s value was recently at $0.181273 USD to 1 XRP, with a market cap of $6,952,298,502 USD (2,001,927 BTC). It had a circulating supply of 38,352,642,160 XRP out of a total supply of 99,994,523,265 XRP (Max supply of 100,000,000,000 XRP). It had a 24 hour volume of $51,231,000 USD (14,752 BTC). Litecoin: Litecoin was launched in 2011. LiteCoin is a flat-out cryptocurrency meant for peer-to-peer transfers. It claims to be complementary to Bitcoin, as well as to have faster transaction confirmation times, and to have instant, near-zero cost payments to anyone in the world. It also claims that it’s blockchain can handle a higher transaction volume than Bitcoin without needing to modify their software in the future. Litecoin was recently around $46.91 USD per 1 LTC, with a market cap of $2,458,486,672 USD (708,394 BTC). It had a circulating supply of 52,408,807 LTC out of a total of 84,000,000 LTC. And in a 24 hour period, it had a moving volume of $136,161,000 USD (39,234 BTC). DASH: Dash was originally released with the name XCoin near the beginning of 2014, which was then changed to Darkcoin near the end of March 2015, and was finally rebranded as Dash, due to it’s previous name’s negative connotations. It is also a straight digital currency, and with it’s InstantSend, payments are confirmed in less than a second. A big selling point for Dash to many is likely it’s claim for quick and 100% anonymous transactions – hence it’s previous names. Dash recently had a value of around $203.34 USD per 1 DASH, with a market cap of $1,521,945,826 (438,538 BTC). It had a circulating supply of 7,484,881 DASH out of a total max supply of 18,900,000 DASH. Over a 24 hour time period, it had a moving volume of $30,293,900 USD (8,729 BTC). Monero: Monero was created near the end of the 1st quarter of 2014. It is a derivative of Bitcoin. Monero was also designed as a straightforward cryptocurrency, and like Dash, it’s fame lay largely in it’s claims of complete anonymity and untraceability of transactions by shuffling around public keys, creating multiple unique one-time addresses, etc. As many others do, it’s wallet claims to be extremely secure. Monero was recently around $49.94 USD per 1 XMR. It had a market cap of $744,946,798 USD (214,875 BTC), and a circulating supply of 14,917,852 XMR. In a 24 hour time period the digital token had a moving volume of $8,885,600 USD (2,563 BTC). WAVES: Waves is a newer platform which was designed to allow anyone to easily create their own blockchain tokens. The Waves token itself was recently worth around $5.46 USD per 1 WAVES, with a market cap of $546,387,000 USD (157,602 BTC). It had a circulating supply of 100,000,000 WAVES. In a 24 hour period, it’s had a volume of $8,468,620 USD (2,443 BTC). “Zcash is the first open, permissionless cryptocurrency that can fully protect the privacy of transactions using zero-knowledge cryptography.” Zcash is a straight cryptocurrency, which is said by their website to have “selective transparency of transactions”. Their pioneered ‘zero-knowledge proofs’ allow fully encrypted transactions to be verified. They also brag that if Bitcoin is like http for money, then their token is like https – a secure transport layer. The Zcash token was recently worth around $234.60 USD per 1 ZEC, with a market cap of $454,123,490 USD (130,907 BTC). It had a circulating supply of 1,935,719 ZEC. In a 24 hour period, it had a volume of $20,884,000 USD (6,020 BTC). Iconomi: The Iconomi platform is a digital currency investment platform, allowing people to invest in cryptocurrencies or groups of cryptocurrencies. They can even start their own investment bunch. It uses Digital Asset Arrays (DAA), for investors to invest in. 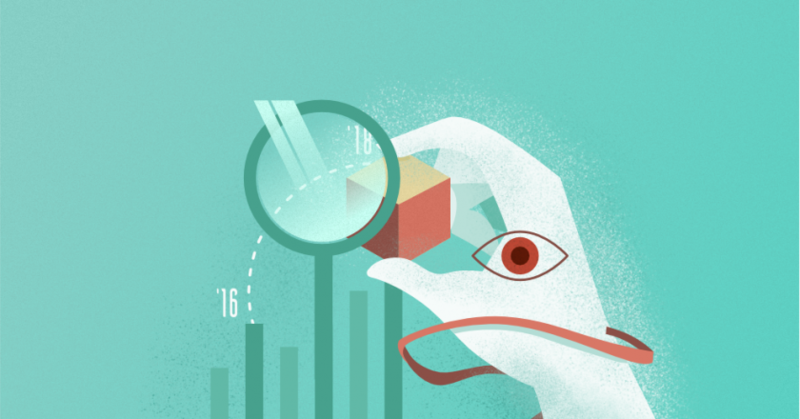 The platform also sorts out well performing digital assets for investing. The token is likened unto buying into shares of the platform and is also apparently needed to participate on the platform. The Iconomi’s token was recently around $2.74 USD per 1 ICN, with a market cap of $238,347,673 USD (68,677 BTC / 788,793 ETH). It had a circulating supply of 86,900,350 ICN out of a total supply of 99,900,350 ICN. In a 24 hour time frame, it had a moving volume of $2,336,400 USD (673.20 BTC / 7,732 ETH). Augur: Augur is a forecasting platform combining prediction markets and a decentralized network. The Augur Token (REP) is needed to operate the system. The Augur token was recently worth around $22.32 USD to 1 REP, with a market cap of $245,470,500 USD (71,478 BTC / 814,429 ETH). It had a circulating supply of 11,000,000 REP, and had a 24 hour moving volume of $4,563,810 USD (1,329 BTC / 15,142 ETH). Golem: Golem is a decentralized computation sharing network, or a decentralized supercomputer. It utilizes a network of participant’s computers to compute things requiring large computational power. The Golem token (GNT) is necessary to interact with the Golem network. The Golem token was recently around $0.276427 USD per 1 GNT, with a market cap of $230,272,537 USD (67,061 BTC / 764,354 ETH). It had a circulating supply of 833,032,000 GNT out of a total supply of 1,000,000,000 GNT. It had a 24 hour moving volume of $6,592,480 USD (1,920 BTC / 21,883 ETH). Civic: Civic is a decentralized identity protection app. The token is used within the system between users. Civic’s token was recently worth around $0.636416 USD per 1 CVC, with a market cap of around $216,381,440 USD (62,739 BTC / 715,642 ETH). It had a circulating supply of 340,000,000 CVC out of a total supply of 1,000,000,000 CVC. This is just a small sampling of cryptocurrencies, but as you can see, they are very diverse in most every way. Other differences may include things like block rewards, specifics on the software and coding, open source or not, etc. All in all, the cryptocurrency market appears that it’s going to be around for a long time. And DinarDirham is pleased to be a part of it with our gold price pegged DinarCoins and our gold backed Gold Smart Contracts on the Ethereum blockchain. 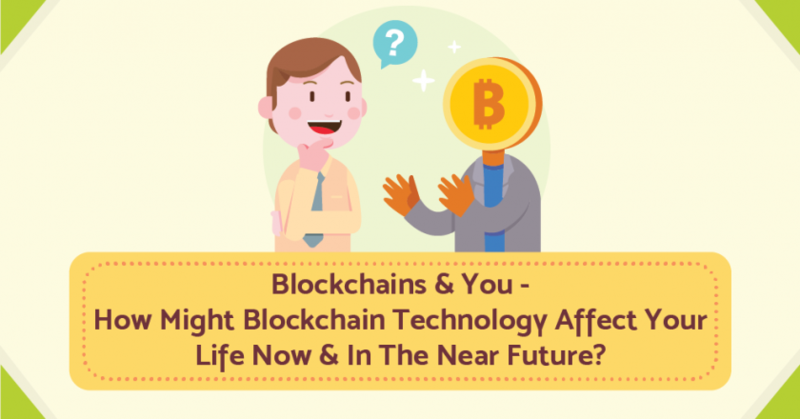 Blockchains & You – How Might Blockchain Technology Affect Your Life Now & In The Near Future? Do not speculate on crypto currencies. Read and understand the white paper first. Each crypto currency gives their own roadmap in the whitepaper. A crypto currency may look stagnant in the coinmarketcap due to the response from the eco system itself. The insight of each whitepaper gives us the full understanding how and when the coin should kickstart.